After a hard loss to Ivory Coast on Saturday, Japan's supporters didn't storm out of rainy Arena Pernambuco in Recife. At least some of them stuck around, bags in hand, to pick up their trash. 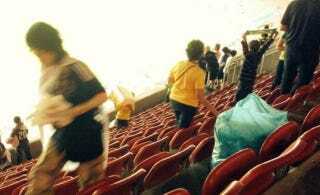 It's actually customary for Japanese fans at sporting events to clean up after themselves. And while moral relativism may have some truck, this is one tradition that's objectively a good one.